which translates as: "Gaius Cestius, son of Lucius, of the gens Pobilia, member of the College of Epulones, praetor, tribune of the plebs, septemvir of the Epulones". 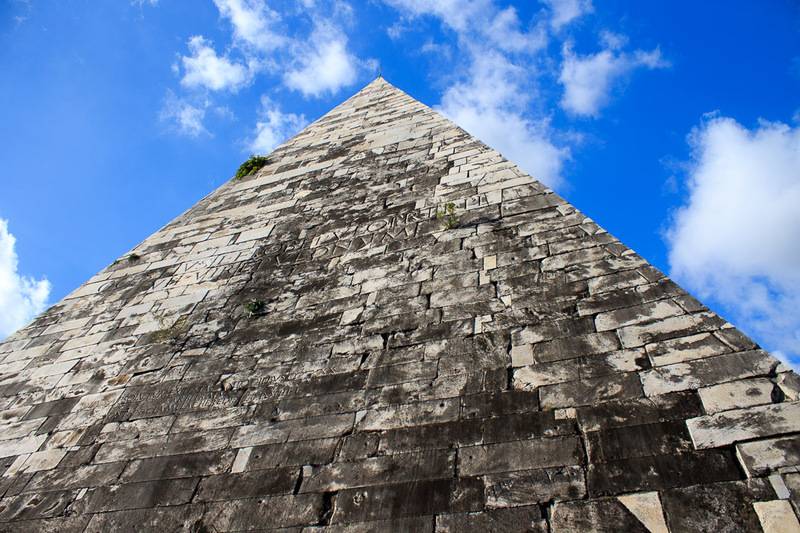 The pyramid was built in only 330 days, as ordered by Cestius in his will. The pyramid is 120 feet tall and 97 feet wide on each side at the base, and it rises at a much sharper angle than the famous pyramids in Egypt. It has a travertine foundation, with the pyramid made of concrete covered by brick, then covered by sheets of white marble. 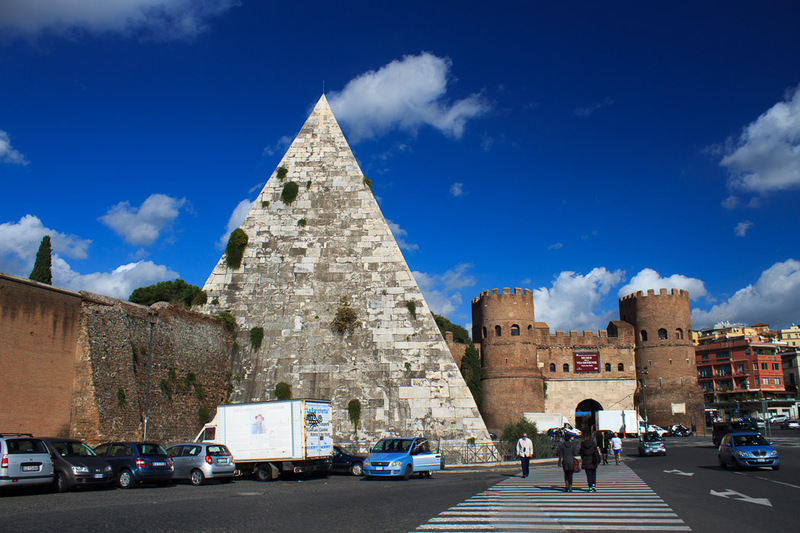 A larger pyramid, the Pyramid of Romulus, once stood near Castel Sant'Angelo, but it was demolished in the 16th century and its marble was used in the stairs of St. Peter's Basilica, leaving the Pyramid of Cestius as the only Pyramid in Rome. 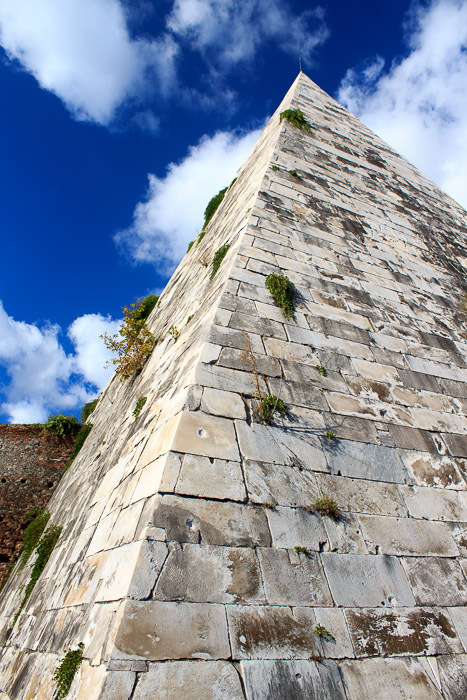 See all Pyramid of Cestius photos. The Pyramid of Cestius was built during a period when Rome was going through a fad for all things Egyptian in the wake of their 30 BC conquest of Egypt. For example, the Flaminian Obelisk and the Solar Obelisk were brought from Egypt by Augustus to adorn the Circus Maximus, and for a huge sundial, respectively. Part of Rome's fascination with Egypt is similar to our fascination with Rome, in that at the time of the Roman Empire, the pyramids were as ancient to the Romans as the Romans are to us today. Inside the pyramid is a simple barrel-vaulted burial chamber measuring 19 feet by 13 feet by 15 feet tall, which was discovered in 1660 and was decorated with lively frescoes which have since faded from view due in part to damage by seeping water. The burial chamber had apparently been plundered in antiquity because nothing beside the frescoes was present in 1660. The burial chamber is not open to the public; only the outside of the pyramid can be seen. (2014 update: the restored pyramid is now open to the public on the second and fourth Saturday of each month, with reservations being required.) 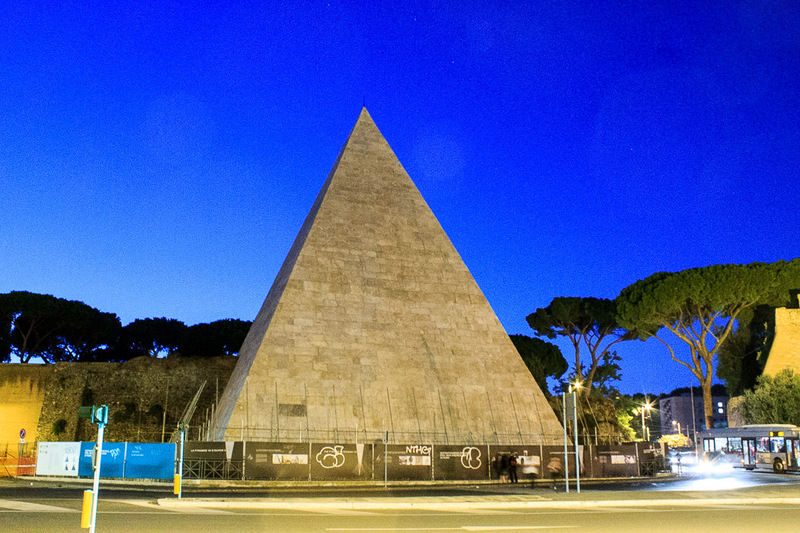 The pyramid is located on a busy traffic square outside the Piramide metro station. 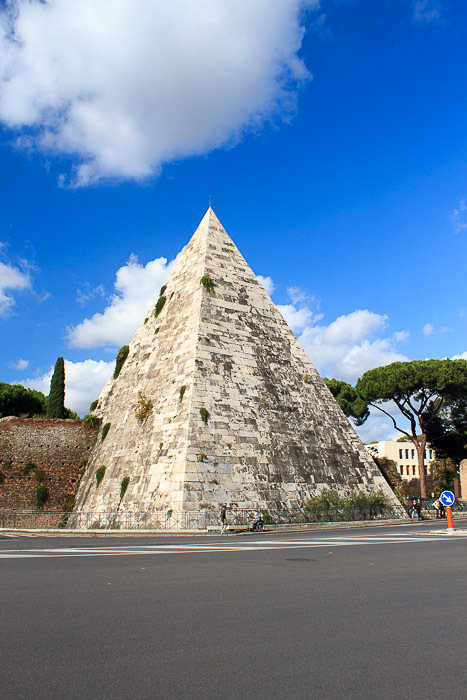 For a view of the pyramid without the traffic of the several main roads that cross in front of it, go inside the Aurelian wall to the Protestant Cemetery on the northwest side and have a look from there. Since tombs were forbidden within the city walls, the Pyramid of Cestius stood outside the Servian Wall and was probably originally in unpopulated countryside along with other tombs. Two bronze figures (now in the Capitoline Museum) surrounded the pyramid. The pyramid was incorporated into the Aurelian Wall when the wall was built between 271 AD and 275 AD, as were many other buildings. The pyramid was partially restored in 2001, and in 2013 a several-year project was started to restore the outside of the pyramid and prevent water seepage which has endangered the frescoes within. So when I visited a second time in 2013, the pyramid was covered by scaffolding (2nd photo below). 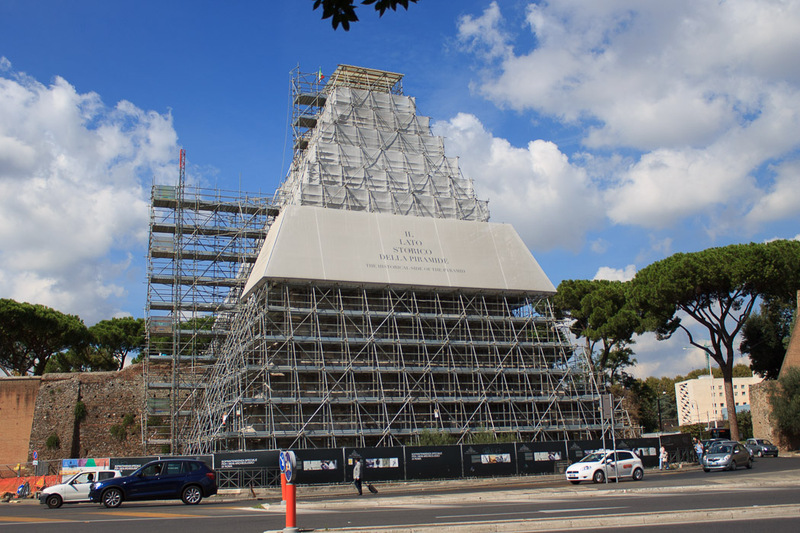 This makes at least 7 things that are undergoing renovation in fall of 2013, the other six being the Arch of Constantine, the Colosseum, the Fountain of Ponte Sisto, the Triton Fountain, the Bernini Fountain and the Fountain at Villa Medici. In fall of 2014, the restoration was almost complete (see 3rd photo below), and as of April, 2015, the restoration is finished.